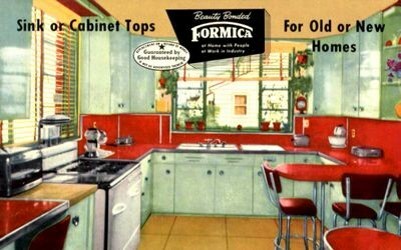 The ’50s and 60’s kitchen was all about “modern conveniences” and new manufactured finishes that made the latest looks more affordable for a growing post-war family. 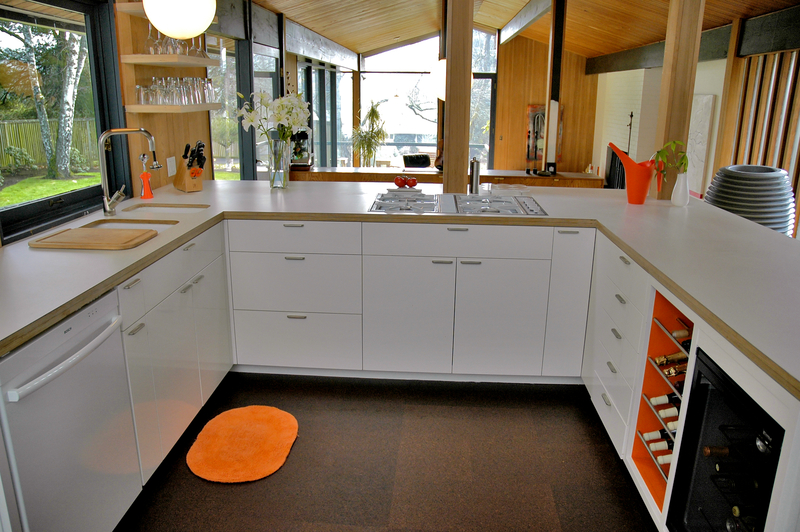 The look was sleek, with minimal ornamentation and increasing use of wood veneers, laminates and manufactured finishes. Full Overlay Cabinets. Cabinets doors completely concealed the face frame behind it. 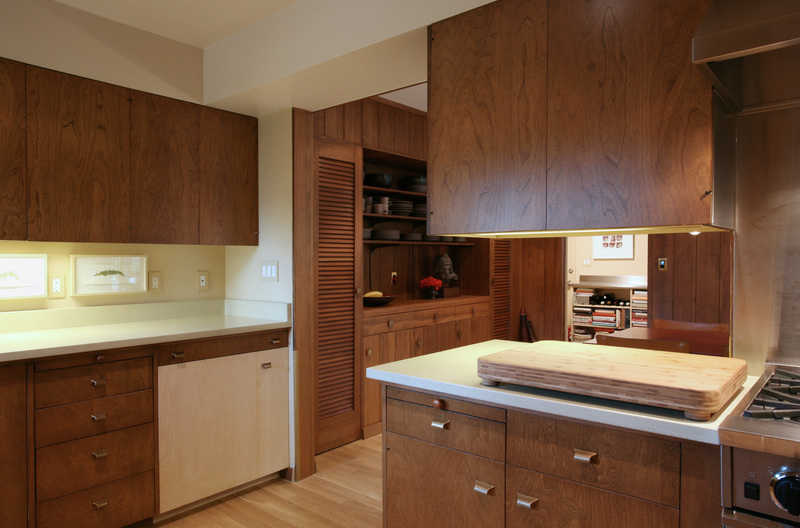 This 1962 whole house remodel features a Mid-Century Modern inspired kitchen with full overlay doors and drawers, simple hardware and strong, simple shapes. Design by Anne De Wolf. Slab Doors. Simple, flush un-ornamented doors were popular, creating clean lines and simple shapes. 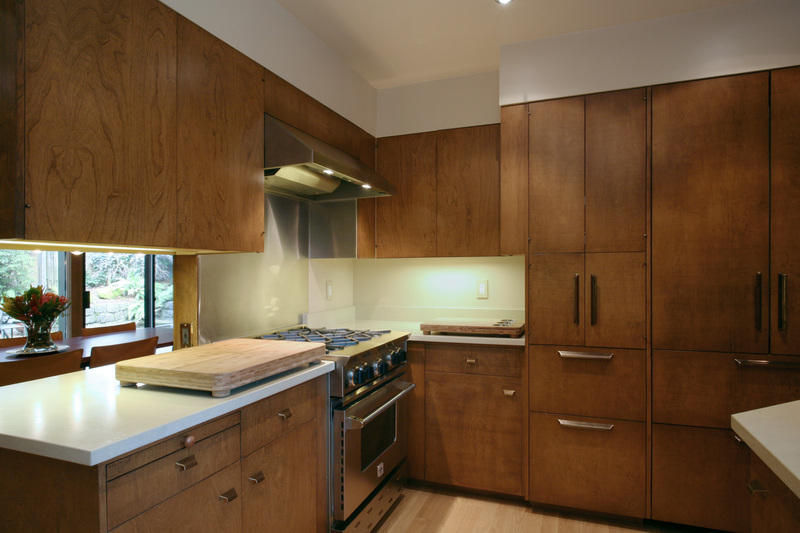 This Saul Zaik home features full overlay slab doors in the kitchen with wood edged laminate counter tops. 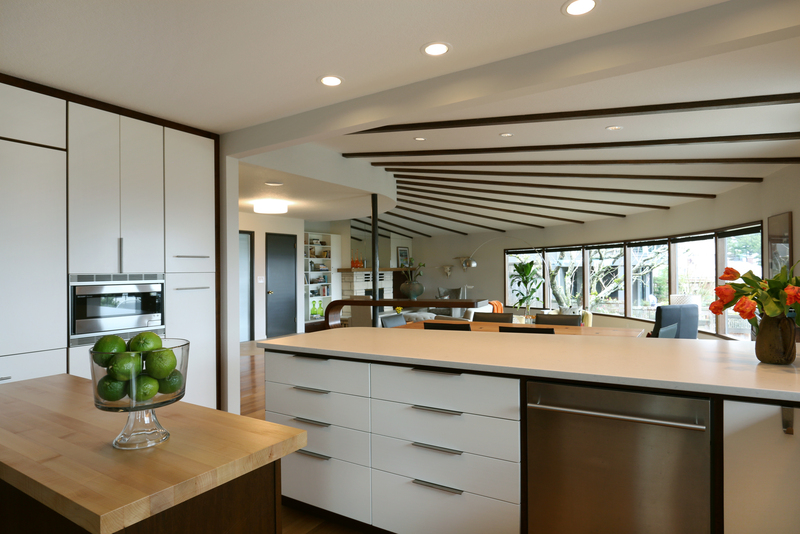 Lines were kept simple to keep the focus on the dramatic ceiling lines and large windows of this classic Mid-Century Modern home. Design by Brian Carleton, built by Arciform. Wood Veneers. Manufactured finishes like wood veneers and laminates became very popular during this era, along with counter tops that sometimes came with contrasting or matching wood, metal or laminate edging. This restored kitchen in the Alameda neigborhood integrated new cabinets alongside the existing cabinets. Exact replicas of the brass hardware were custom made for the kitchen and a new fridge was tucked behind panels that were designed to blend with the rest of the kitchen. Design by Anne De Wolf. Would you like to refresh your kitchen’s sleek Mod style? Our designers can help you integrate modern conveniences while including style elements that fit the era of your home. Schedule a design consultation to begin planning your own perfect kitchen here.